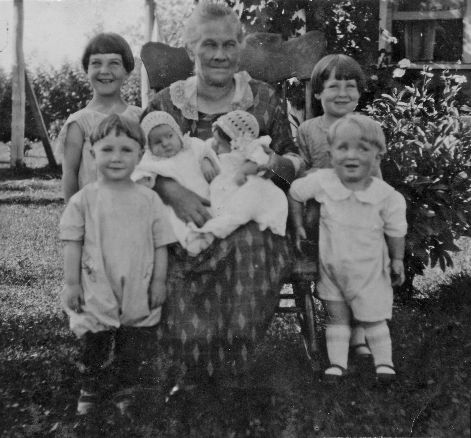 About 1925: Harriet Johnson with a few of her grandchildren. K. Notice the lace caps she made for her baby granddaughters. My sister Jill once asked me how far back I could repeat my "mother line." She said she had taught all her daughters the first few generations starting with mother, mother's mother, grandmother's mother and so on. I don't remember how far back I went. But it's very true that we have a choice "mother line." During this women's history month of March I've blogged about my mother and my grandmother. Today I'm thinking about my great-grandmother Harriet Emaline Lamb Johnson, who was my mother's maternal grandma. Harriet was born 23 February 1862 in Lehi, Utah. Like me, she had lots of sisters that she was very close to. My grandmother said that she had an extremely pleasant disposition. I would love that to be said of me. In fact I think of Grandma Harriet sometimes when I'm tempted to lose my cool. Harriet was family and service oriented. She was a faithful Church member. The bishop once announced in meeting that "Sister Johnson" was second only to him in church attendance. She was a hard worker. She supported her large family while her husband was on a mission. Grandma Harriet Johnson made a recipe she called "floating island pudding." Some in the family think this recipe came from her Danish in-laws. My mother believed it originated in Grandma's German heritage. Wherever it came from, it was well-loved by her children, grandchildren and great-grandchildren. Only one of my sons enjoyed it as much as I did, and I've stopped making it because I don't eat desserts anymore. Here's the recipe as updated by my youngest sister. Combine 1 3/4 C. flour, 2 1/2 t. baking powder, 3/4 t. salt. Cut a little more than 1/2 C.shortening into the flour mixture with a pastry mixer or two knives. Add 3/4 C. milk a little at a time until dough is pliable, but not sticky. and long enough to form into a circle. Slice and peel about 5 apples. Place apples in the middle of the rectangle. Fold dough over the apples, pinching together at the top. This is the dumpling. Add enough boiling water until the dumpling is barely covered. Sprinkle with more sugar and cinnamon. Slice 1/4 C. butter or margarine thinly and place them on top of the dumpling circle. Thanks Shelley, I appreciate the honor. Give Your Story Some "Webness"